24 December 1167, Beaumont Palace, Oxford. 29 August 1189, Marlborough Castle, Wiltshire. 24 August 1200, Bordeaux, France. 27 May 1199, Westminster Abbey. Peace treaty signed at le Goulet, 22 May 1200. John forfeits Aquitaine, Anjou, Poitou and Normandy, April 1202. 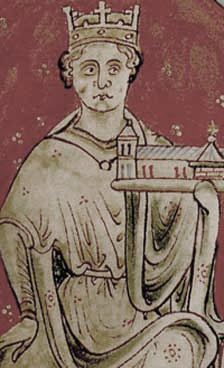 Phillipe II of France takes full control of Normandy, June 1204. Castles at Chinon and Loches lost to the French, 1205. John retakes some land in Aquitaine, June 1206. John banishes the Earl of Leicester, 1207. Pope serves interdict on England banning church services, 1208. John excommunicated by the Pope, November 1209. John gives way to the Pope, November 1212. Interdict lifted, 29 July 1214. Magna Carta signed at Runnymede, 17 June 1215.